VATICAN CITY (CNS) — Although God is all-powerful, when it comes to sins, he has one weakness: a bad memory, Pope Francis said. “Once he forgives you, he forgets. This is great,” the pope told a group of seminarians, new priests and priests who hear confessions in the major basilicas of Rome. “Every faithful penitent, after receiving absolution from the priest, has the certainty through faith that their sins no longer exist, they have been canceled by divine mercy,” he told the group March 4. 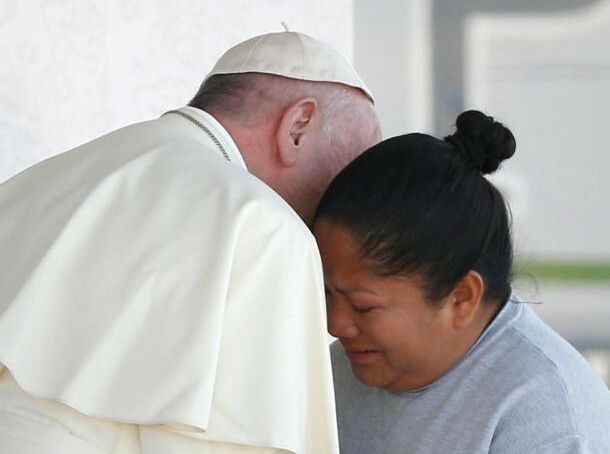 The forgiveness of sins offered in the sacrament of reconciliation is open to all and is “the greatest of the ‘holy doors'” that remain wide open to those wounded by sin and who wish to experience God’s love and mercy, the pope said. Departing from his prepared remarks, the pope highlighted the importance of celebrating God’s forgiveness in the sacrament. “Let us not forget this: It is very easy to go (to confession), ask forgiveness, feel the embrace of forgiveness and forget to celebrate. This isn’t theological doctrine, but I would say that celebration is part of the sacrament. Just as penance is part (of the sacrament), so is celebration; I must celebrate with the father who has forgiven me,” the pope said. Those who administer the sacrament of confession, he said, are called to follow the example of St. Padre Pio and St. Leopold Mandic, two Capuchins known for the long hours they would spend hearing confessions. Offering God’s love and mercy like they did means looking for a way to offer absolution to penitents even in the most difficult situations, not being “tied down” only to what the penitent is able to say, but recognizing his or her presence in the confessional as a sign of repentance. Ministers must also learn to “speak like a father” when unable to offer absolution and assure penitents — especially those weary of being “beaten over the head” — of the paternal warmth of God’s love. “How many times have you heard people who say: ‘I will never confess again because one time I went and he shouted at me.’ Even if I can’t absolve them, they can at least feel the warmth of a father, who blesses them and says: ‘Come back, come back’ and to pray with him or her,” the pope said. The sacrament of reconciliation is “true space of the Spirit in which everyone, confessor and penitent, can experience the definitive and faithful love of God for each one of his children, a love that never disappoints,” he said.